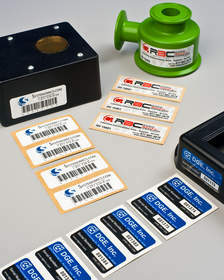 March 04, 2011 14:48 ET | Source: Nameplates for Industry, Inc.
NFi Product ID Labels are custom engineered and printed on the appropriate material and incorporate aggressive adhesives for bonding to powder coated surfaces or other demanding applications. These product identification labels can feature multiple fields of variable data including serial numbers and barcodes, and can be printed with full-color graphics to combine branding with asset management. NEW BEDFORD, MA--(Marketwire - March 4, 2011) - Nameplates for Industry, Inc. (NFi) is introducing custom engineered product ID labels that combine brand recognition and asset management functions along with strict surface adhesion properties. NFi Product ID Labels are custom engineered and printed on the appropriate material and incorporate aggressive adhesives for bonding to powder coated surfaces or other demanding applications. Featuring multiple fields of variable data including serial numbers and barcodes, these product identification labels can be printed with full-color graphics to combine branding with functional asset management requirements. Supplied on strips, NFi Product Identification Labels can be manufactured from a wide variety of materials including Mylar®, Lexan®, and PVC in sizes from 3/8" sq. up to 11" x 17". Suitable for asset management and inventory tracking, they are ideal for appliances, electronic devices, medical instruments, industrial instrumentation, sensors, and laboratory equipment. NFi Product ID Labels are priced according to material, size, and quantity. Representative free samples and price quotations are available upon request. NFi has a skilled team that prides itself on producing custom printed nameplates, faceplates, membrane switches, decals, labels, serial number tags, tamper-proof seals, keypad & back-lit graphic overlays, plastic cards and templates for a wide range of companies. Their customers include manufacturers of consumer appliances, computers, commercial machinery, communications equipment, medical devices, instrumentation and controls.